- There is a limit of 5 of this course per order. Participating yet again the Super GT - the cutting edge of Japanese motorsports - in our Hatsune Miku BMW, Goodsmile Racing & TeamUKYO is asking you to take part in our personal sponsorship program and become part of a winning team. 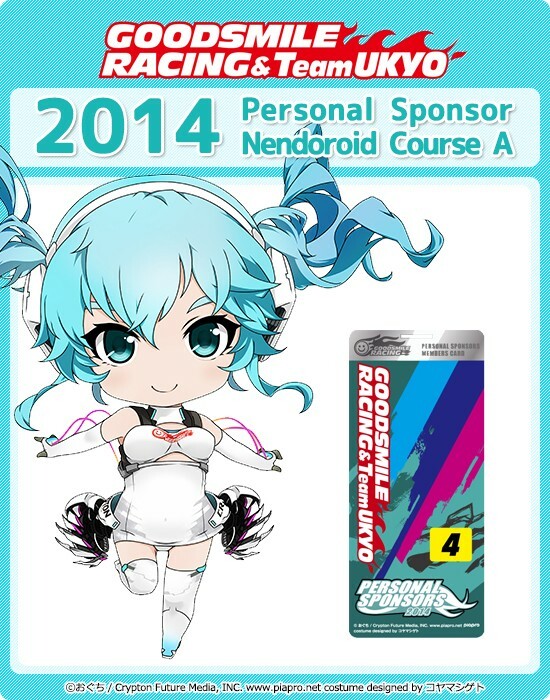 In addition to all the privileges and benefits associated with becoming a Personal Sponsor, this all-new 2014 Personal Sponsorship Course also includes a Nendoroid version of this year's exclusive mascot character, Racing Miku 2014! Registration will be open from (Tues) May 13 to (Mon) May 19, 2014 at 23:59 (JST). ・Nendoroid Racing Miku 2014 Ver. - Payment will be processed upon order, and not when the product is sent.